The video ESA video Progress launch timelapse seen from space is of course striking for many reasons. However there is a strange, blinking light structure on Earth that's quite puzzling! I've added a GIF from two screen shots that I've cropped, shifted, zoomed and sharpened to highlight what I'm talking about. It can't be a reflection from an ISS window because it remains fixed within all the other lights on the Earth. Look after 00:55 in the video, where it flashes at about 2 Hz. Timelapse of the Russian Progress MS-10 cargo spacecraft launched on 16 November 2018 at 18:14 GMT from Baikonur cosmodrome, Kazakhstan, taken by ESA astronaut Alexander Gerst from the International Space Station. 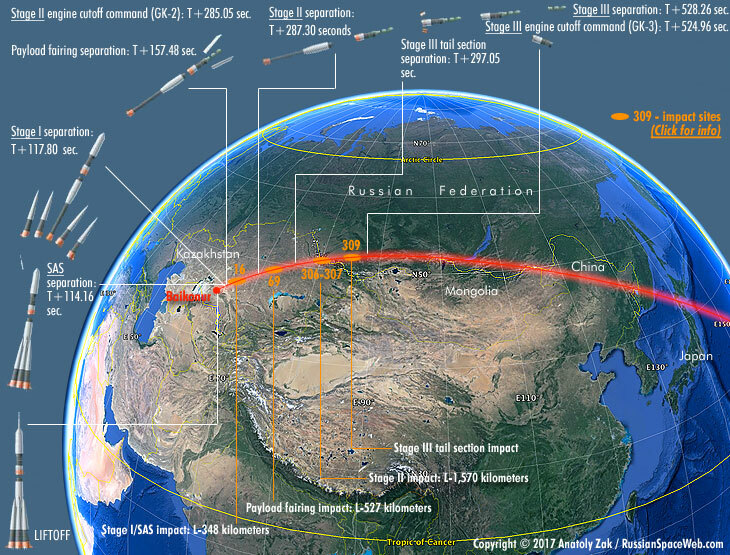 The spacecraft was launched atop a Soyuz rocket with 2564 kg of cargo and supplies. Flying at 28 800 km/h, 400 km high, the International Space Station requires regular supplies from Earth such as this Progress launch. Spacecraft are launched after the Space Station flies overhead so they catch up with the orbital outpost to dock, in this case two days later on 18 November 2018. The images were taken from the European-built Cupola module with a camera set to take pictures at regular intervals. The pictures are then played quickly after each other at 8 to 16 times normal speed. The video shows around 15 minutes of the launch at normal speed. Update: After quite a lot of searching I believe I've found the culprits! 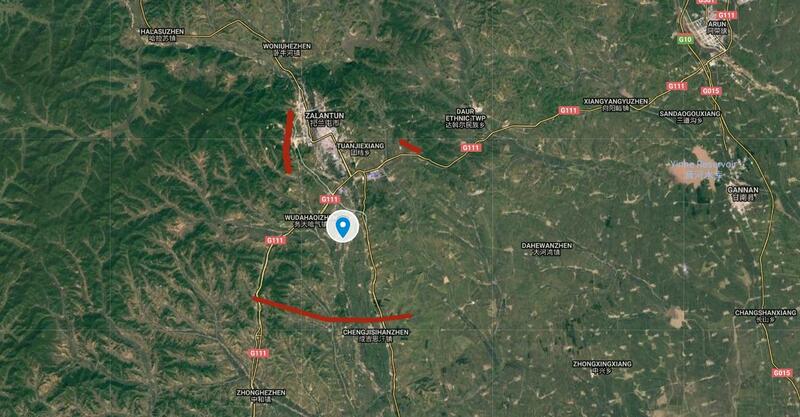 As suggested in the comments, they appear to be a series of very large power lines around the city of Zalantun in Northwest China. The lines are very difficult to discern from aerial imagery, but I have marked them on this map - if you zoom right in on the red lines you can make out pylons and multiple parallel cables. Also marked is an airport between the power lines which explains why they are lit at night. The three large, lit metropolitan areas seen at around 1:03 in the video are the cities of Qiqihar, Daqing and Harbin (from farthest to closest). The footage is taken from the East and from a very low angle and, making the perspective a bit mind-bending, but explaining the exaggerated curvature of the Southernmost power line. As far as I can tell, the lines are (as of the aerial images being taken) still under construction as in may places only the pylons are visible. I was asking myself the same question. My guess is: it could be a street illuminated with LED street lights, and the flicker is an artefact caused by the 50 Hz A/C mains current to power the LEDs and the timing of the camera shutter. Not the answer you're looking for? Browse other questions tagged iss photography identify-this-object earth-observation progress or ask your own question. 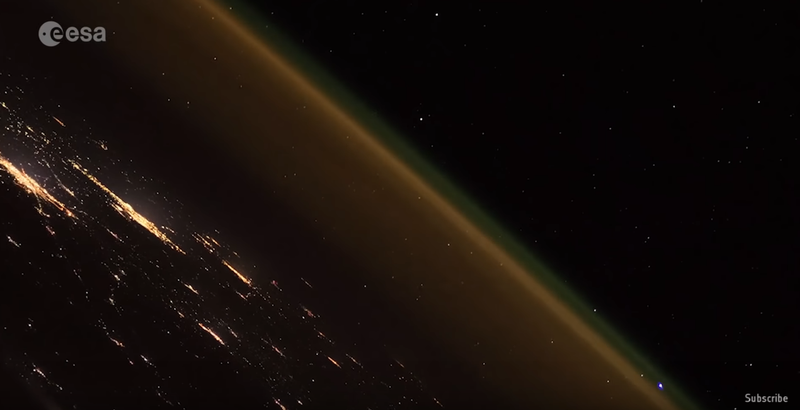 Do ISS astronauts occasionally let the sunshine in for a natural light “fix”? Was this large pieces of “space junk” just released from the ISS in the “nadir and retrograde” direction? When was the ISS's “SPEED LIMIT 17500 MPH” sign originally posted?